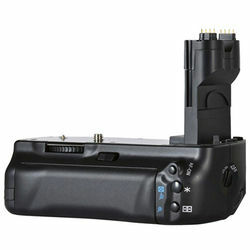 The Digitek Battery Grip C5D MARK III is a dedicated battery grip for the Canon EOS 5D which allows you to use one or two LP-E6 batteries. With two batteries the already long life is doubled and this will be especially useful if using movie mode. The Digitek Battery Grip C5D MARK III is a dedicated battery grip for the Canon EOS 5D which allows you to use one or two LP-E6 batteries. With two batteries the already long life is doubled and this will be especially useful if using movie mode.